This airticle is aboot the Greek god. 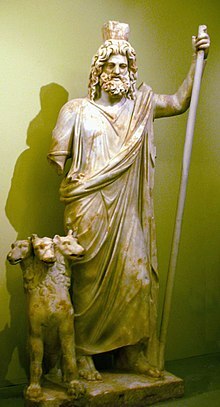 For ither uisses, see Hades (disambiguation). Hades (/ˈheɪdiːz/; Auncient Greek: ᾍδης or Άͅδης, Háidēs) wis the auncient Greek chthonic god o the unnerwarld, which eventually teuk his name. Wikimedia Commons haes media relatit tae Hades. This page wis last eeditit on 26 Julie 2016, at 08:37.